ST GERVAIS - MONT BLANC HAUTE SAVOIE - SMALL CHARACTER COTTAGE. located in a place called chalets, 2 km from the village 5. Small Savoyard chalet character (attached) and comfortable, located in a quiet, from many walks both on foot and by car. Accommodation of 1-15 people, if there is added the other adjoining chalets. In summer, sharing a washing machine. The price of a studio, get a small cottage with terrace !!! Last renovation in October 2014! The Baths of St Gervais is 4 km, possibility of medical cures and fitness - daily or weekly packages. (Shuttle spa, shuttle to the request to the lifts in winter (I offer this service). Special rates for stays of three weeks or more. You want to make the most of your stay, I can offer you a cleaning service on demand and rental of linen, thank you to warn in advance so that everything is ready for your arrival. You will be welcomed by the owners who will share their knowledge of the area and surrounding areas. Pets are welcome and will go with you a wonderful holiday. Soon the pleasure of welcoming you and your family, your friends and your buddies on all fours, in St Gervais. CHALET: We live in the Haute-Savoie, where we offer self catering cottages, summer and winter on HomeAway elsewhere, and now enjoy the fall and spring to enjoy Juan in our villa. It also welcomes both our family our friends because of its practical equipment and according to the latest standards. This cottage was built with a craftsman and ourselves, according to Mr Bertrand plans, which enabled us to achieve the following desires. Mont Blanc, at the foot of which the village of St Gervais is nestled, is seen terrace. We also have special health, since in 50 m2, you will have in two, one at each level. One of the strengths of the cottage is its location, since apart from the noise and bustle of downtown, while enjoying since just 2 km from the center 500. In addition, you can receive 5 or more if we group it with the other chalets. RATE: You want to live St Gervais for three weeks, you will then receive a discount. Thank you to contact us directly. 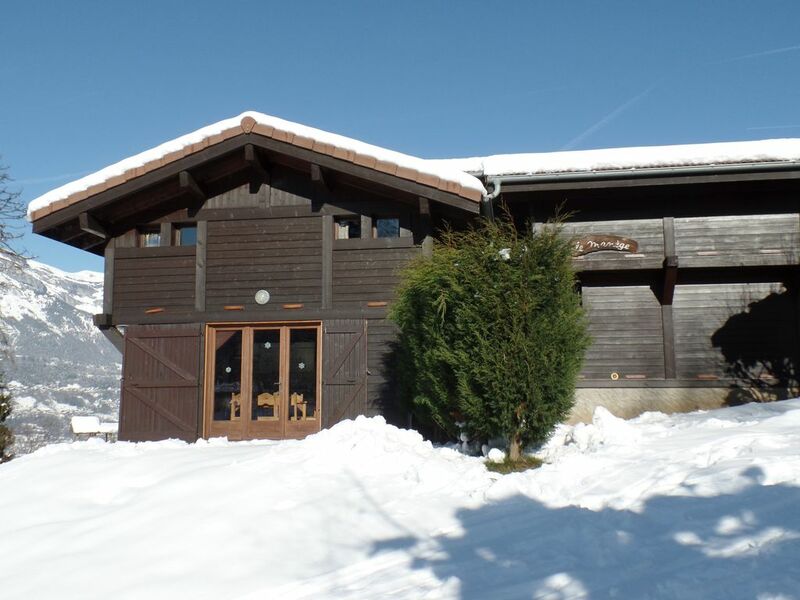 This chalet is only suitable for those wishing to be outside the village center, but a shuttle is available on request and leads to the cable or Fayet. If you wish, I can charge me you book. Also the shuttle passes near the thermal baths. The cottage is also pet friendly, which can take advantage of the wood Amerands that separates the cabin from the cable St Gervais. It is a beautiful walk with perhaps the encounter deer or other animals. What forget all his worries. The bathroom of the ground floor has a shower, sink and toilet. The upstairs bathroom has a sink and a toilet. The chalet is admittedly small, but has a decent equipment in your home: the dishwasher, and dishes to match, microwave, electric stove with oven, kettle, toaster, iron and ironing board, raclette services, both small oven that true scraping device (be careful when buying cheese), fondue, which corresponds to the expectations of everyone. Lovely appartment in a great location. Very well equipped and managed by a lovely lady who couldn't be more helpful. Le chalet idéalement situé nous a permis de passer un agréable séjour. Mme Bertrand est une personne très accueillante. Merci à elle d'accepter nos petits compagnons. La région est magnifique. Nous reviendrons. C'est toujours agréable de recevoir des gens aussi sympathiques que Mme W et ses filles, ainsi que leur chien qui se conduit comme une personne ! Au plaisir de vous accueillir à nouveau une prochaine fois. We enjoyed our stay in two of the of the adjoining chalets. It was quiet, well-equipped and peaceful and we would be happy to go back. There are some lovely walks in the forest nearby but definitely necessary to have a car as not close to any shops or local transport by foot. Thnak you very much, it is always a pleasure to receive our guests and hope to see you again, maybe ? Separated from St Gervais by wood Amerands the Carousel offers many walks, going to St G, Combloux, Lake Passy even the peaks. The chalet is built in a locality other chalets. Each cottage has its grassy terrace (or snowy) with summer garden furniture and sun loungers. Children can frolic without fear, but for animals: no fence, snow forces. Golf: If you play golf, I advise you that of Megève, the course is not difficult, but it requires a lot of attention as placed on the slopes it is banked. We must therefore place his ball. Another golf course 25 km away is the Chamonix, with its breathtaking panorama, as situated opposite the needles of Chamonix. Ski: St Gervais offers 300 km of pistes, as connected with Megeve, St Nicolas de Véroce. Also you can ski with the same package one or more days Contamines and Combloux. Either way you can not do all the tracks in one day, the field is too broad. In St Nicolas, slopes are steeper, Megeve easier and intended (for some) to beginners and St Gervais between. You will be facing Mont Blanc and can enjoy the sun all day following the exposure of the slopes. Pour une location de trois semaines, tarif spécial, merci de vous mettre en relation avec nous. Lorsque nous nous mettons d'accord, je demande le paiement d'un tiers, à la suite de sa réception je vous adresse le contrat, les modalités pour trouver le chalet et en prendre possession, le plan d'accès, en bref tout le dossier afin que vous n'ayez pas de surprise lors de votre arrivée.